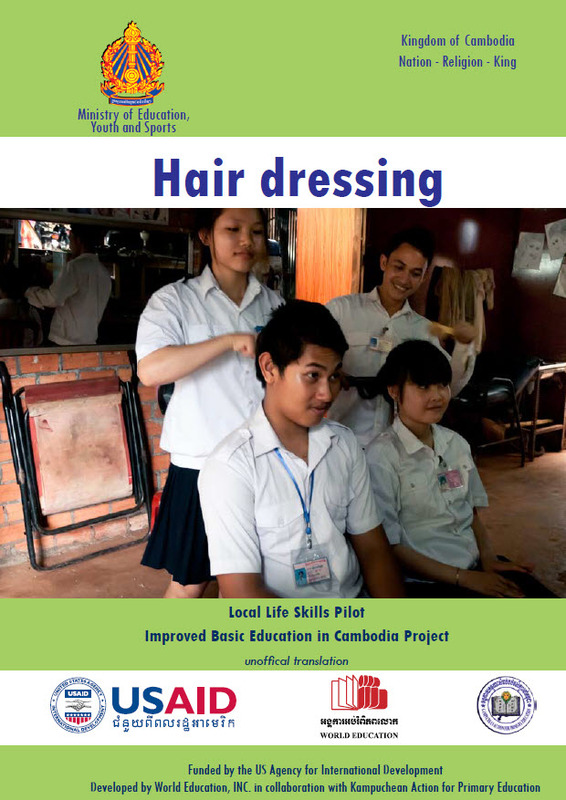 The manual “Hair dressing Life Skill” is intended to assist learners in acquiring knowledge, skills and experience in easy life skills related to daily living in this current society. Hair cutting job is simple but popular in over the country and also foreign country because all people need to be made their hair to be good-looking according to culture of each country, so people who acquire knowledge and are able to do hair cutting properly can make their living better as others people.. . The teaching staff is strongly advised to seek partnerships with hair dressersin order to train the students in smaller groups about hair cutting, since learning girls and boys vocational skills like hair cutting, needs to done by someone with expertise. It is therefore important to investigate possible partnerships with vocational training centers in the province or with local hair dressers . Besides the effort the do to help the school, the teacher can also stress the benefits for the male or female partner. They get the chance to advertise themselves in the local community through the school. This can result in more customers, which means more income. By the end of this life skill program in school, we hope that youths in current society will consider applying this knowledge in a possible future career.